Our popular Racing Beat-designed end links are a direct swap with the MX5 factory links for all 1990-1997 MX-5 front and rear and provide the performance enthusiast the ability to set either front or rear sway bars to a "neutral position" while the chassis is at ride height to avoid pre-loading of the bar. The experienced enthusiast may wish to purposely "pre-load" the bar to create a specific handling characteristic to induce either a mild understeer or oversteer condition. Although the stock end links were well suited for use with the original sway bar, installation of a stronger, stiffer aftermarket sway bar may accelerate the end link wear. This is particularly true if you’re still using the tired, old factory installed units. The Racing Beat end links feature CNC-machined aluminum end housings and are fitted with urethane bushings to further reduce flexing - as compared to softer stock rubber bushing links. We prefer the use of our design as compared to the commonly used "ball-joint" design due to the slightly more forgiving nature of the urethane components used. Each set contains two (2) links to serve one (1) sway bar. 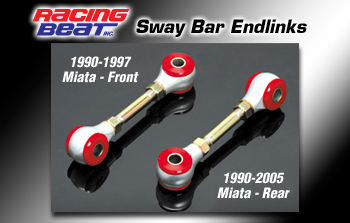 These links have been designed for use on the Mazda stock bar, all Racing Beat sway bars, and comparable aftermarket bars.